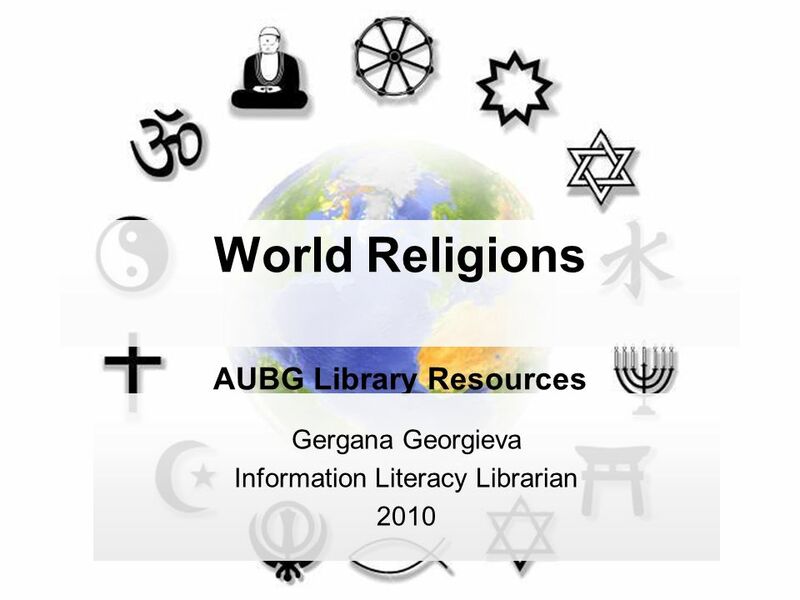 World Religions AUBG Library Resources Gergana Georgieva Information Literacy Librarian 2010. 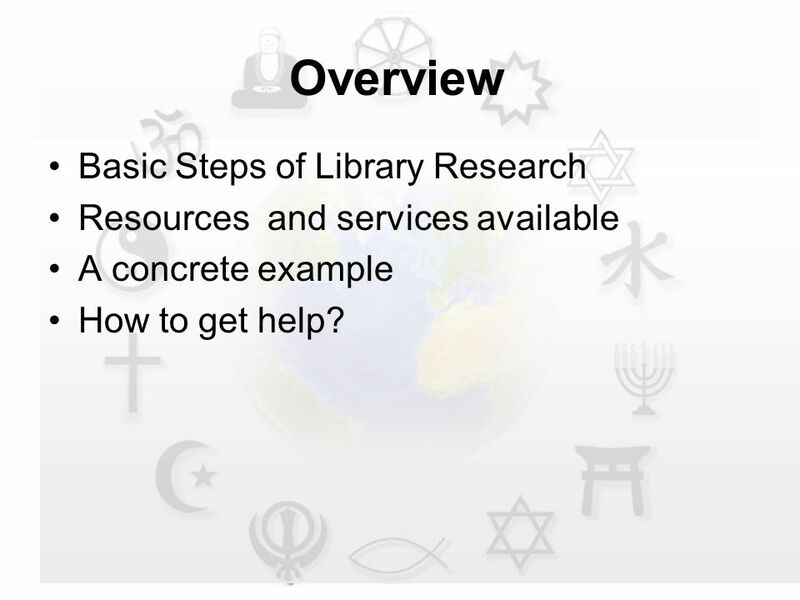 2 Overview Basic Steps of Library Research Resources and services available A concrete example How to get help? 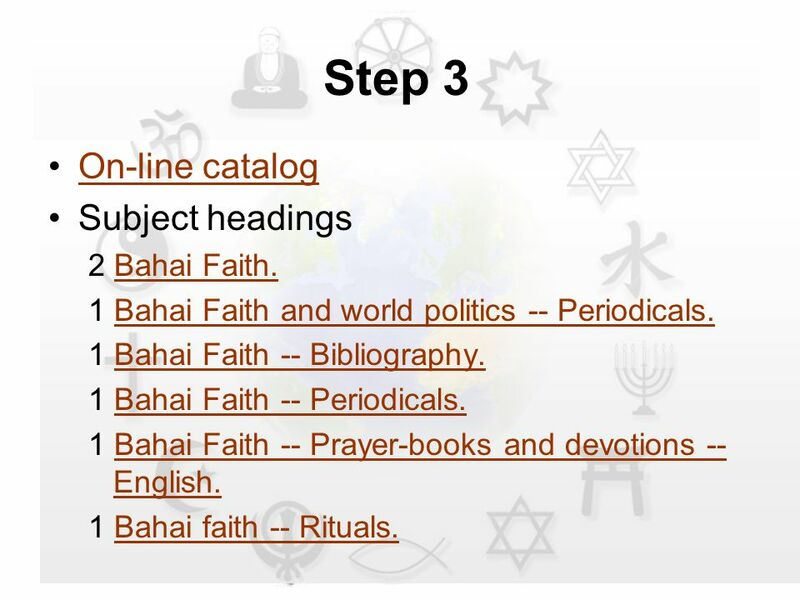 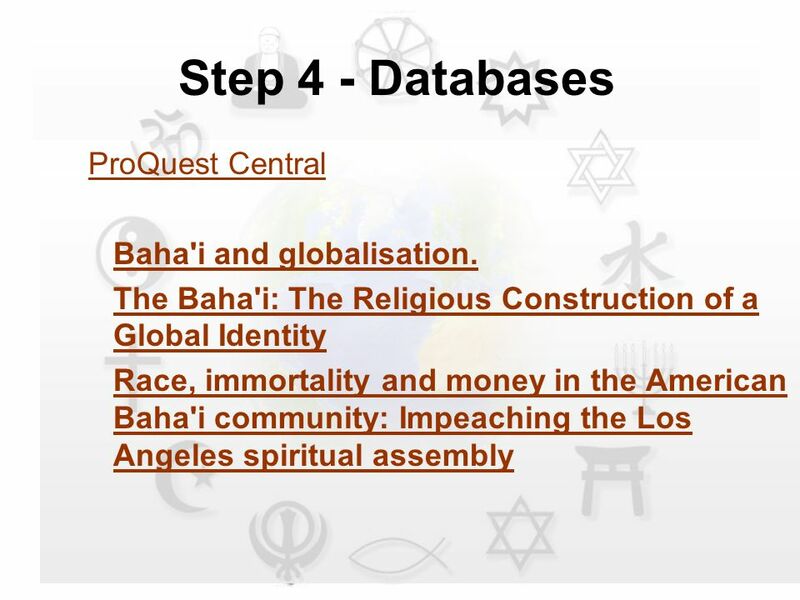 22 Step 3 On-line catalog Subject headings 2 Bahai Faith.Bahai Faith. 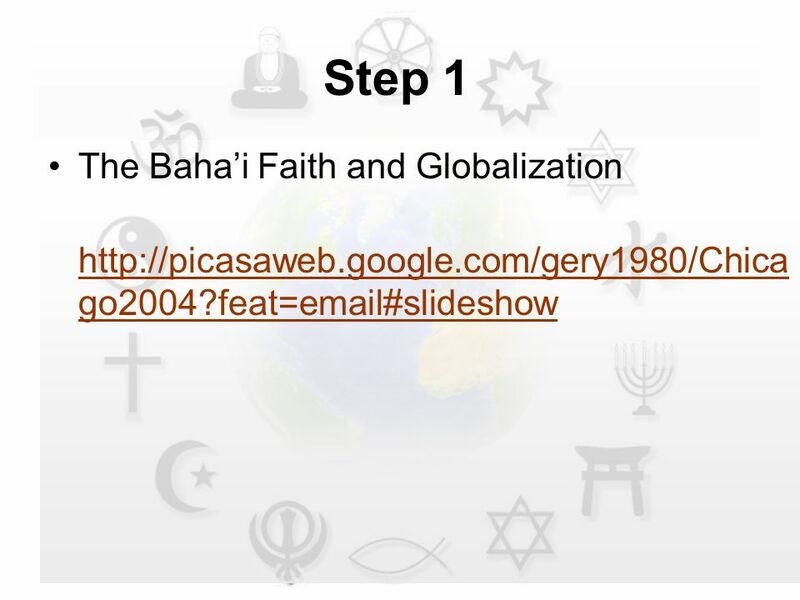 1 Bahai Faith and world politics -- Periodicals.Bahai Faith and world politics -- Periodicals. 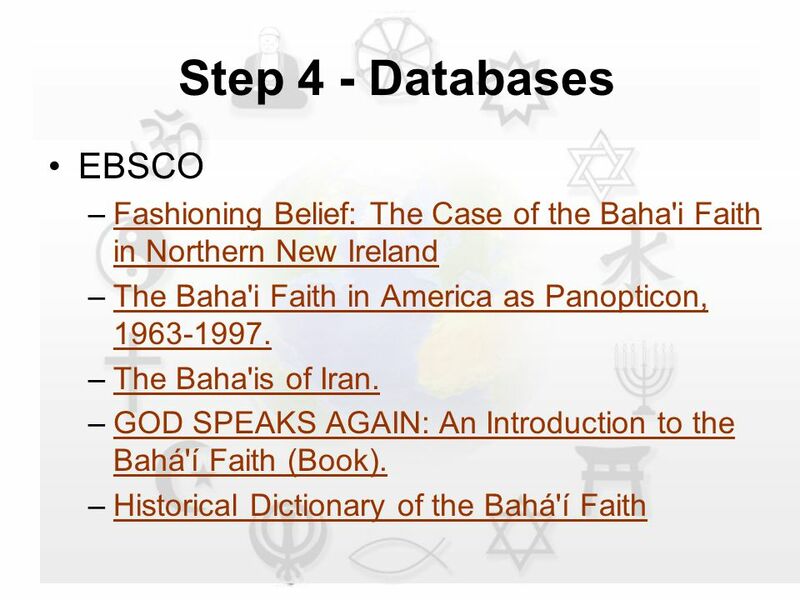 1 Bahai Faith -- Bibliography.Bahai Faith -- Bibliography. 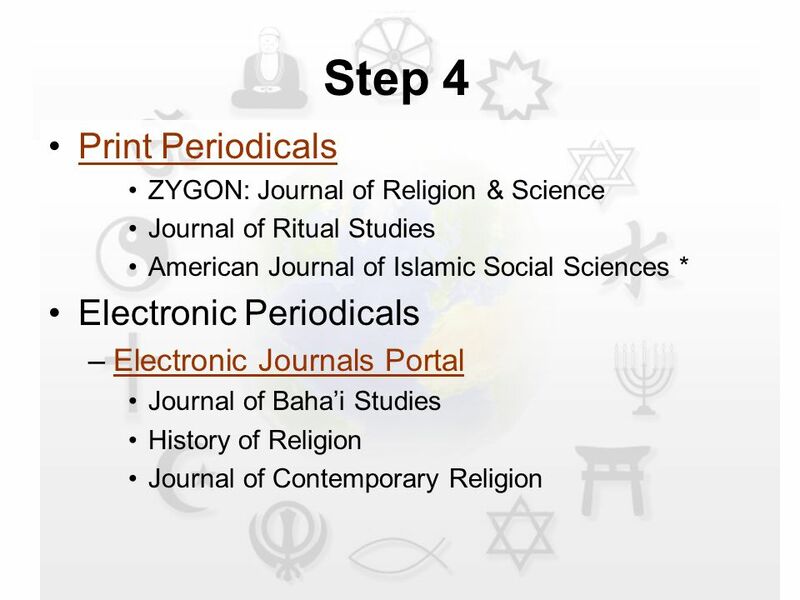 1 Bahai Faith -- Periodicals.Bahai Faith -- Periodicals. 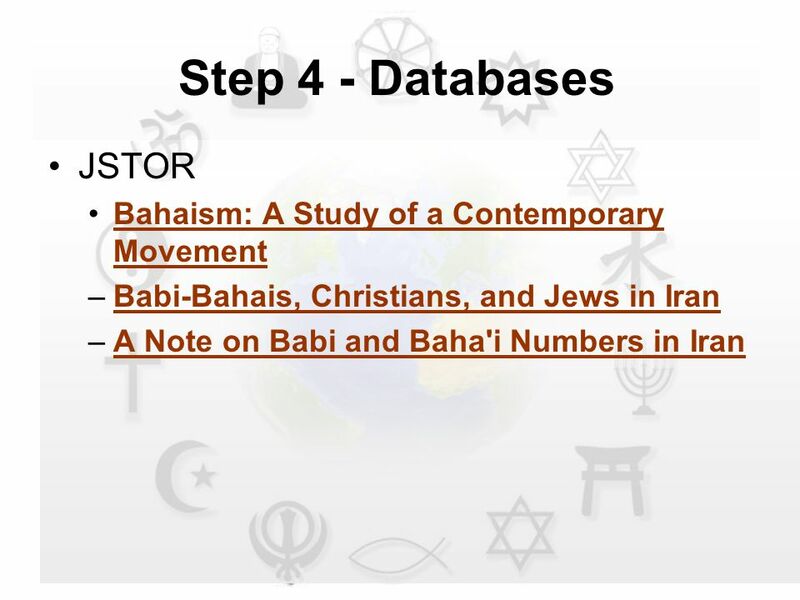 1 Bahai Faith -- Prayer-books and devotions -- English.Bahai Faith -- Prayer-books and devotions -- English. 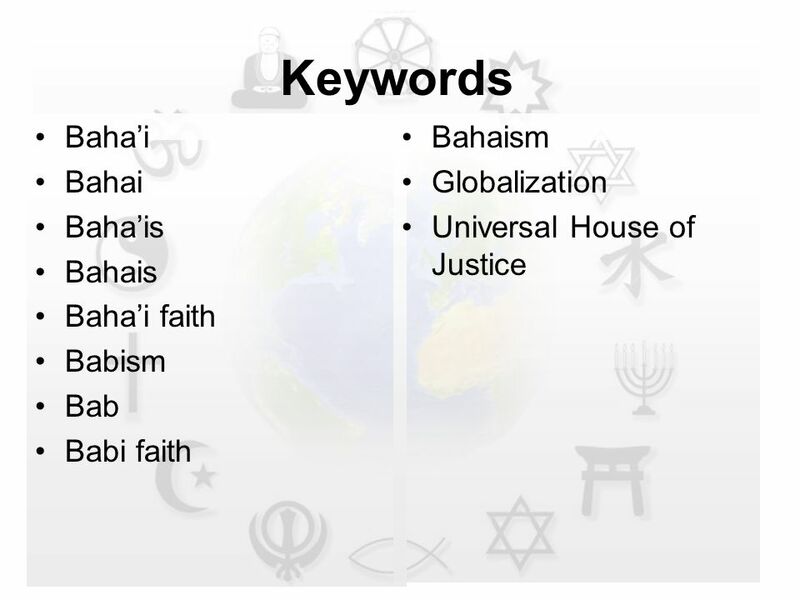 1 Bahai faith -- Rituals.Bahai faith -- Rituals. 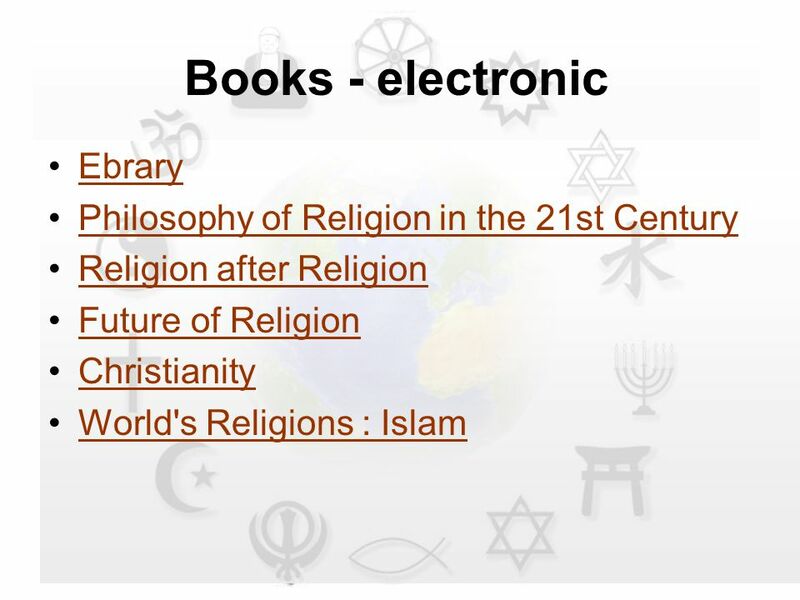 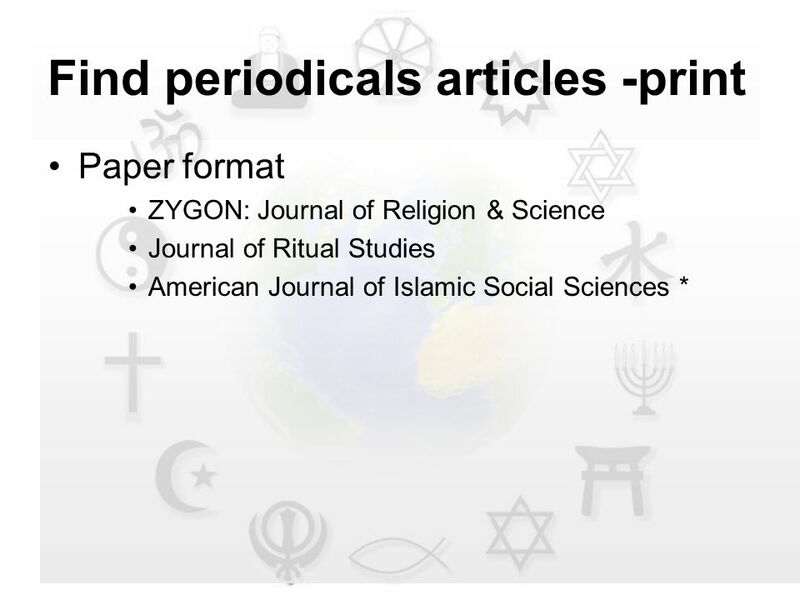 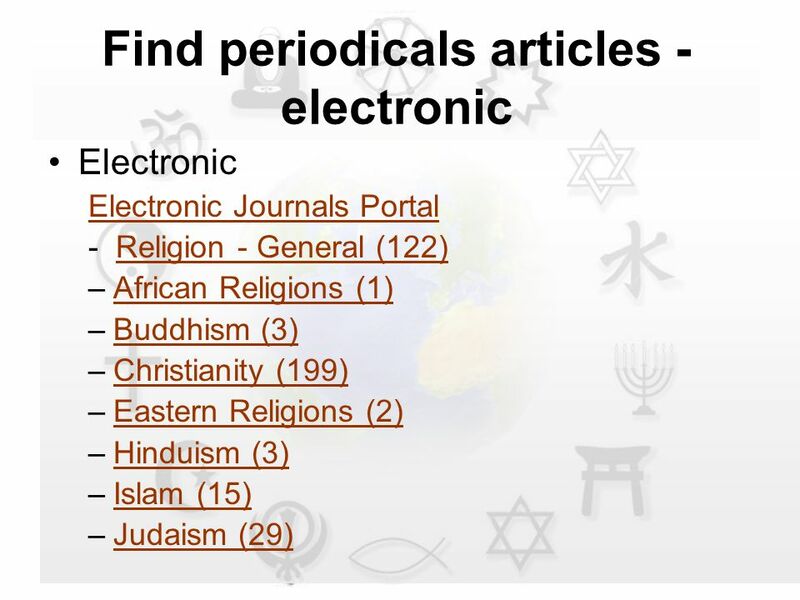 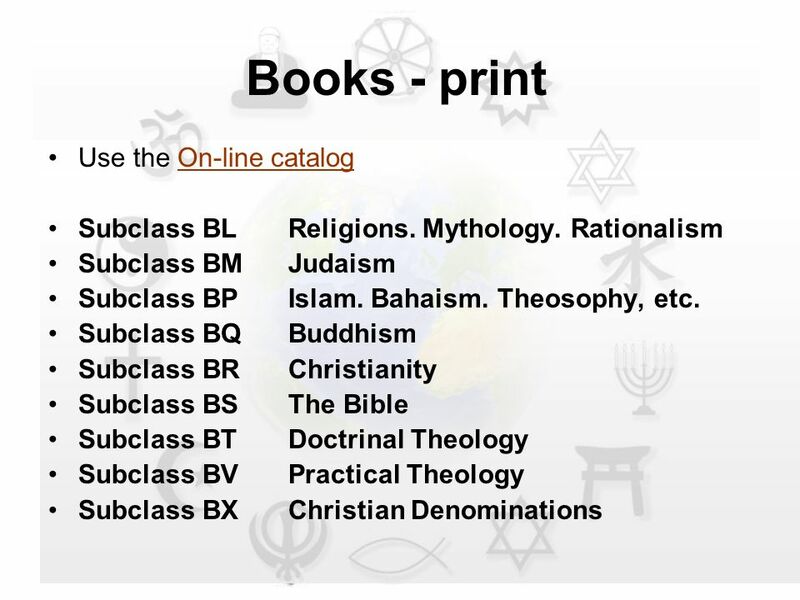 Download ppt "World Religions AUBG Library Resources Gergana Georgieva Information Literacy Librarian 2010." 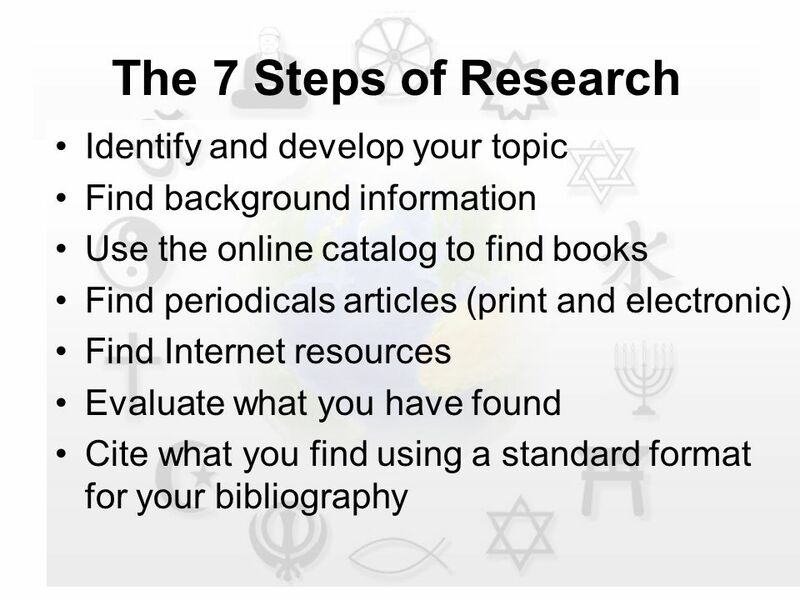 Basic Research Methods In 6 Easy Steps Thomas Winston Cole, Sr. Library Wiley College. 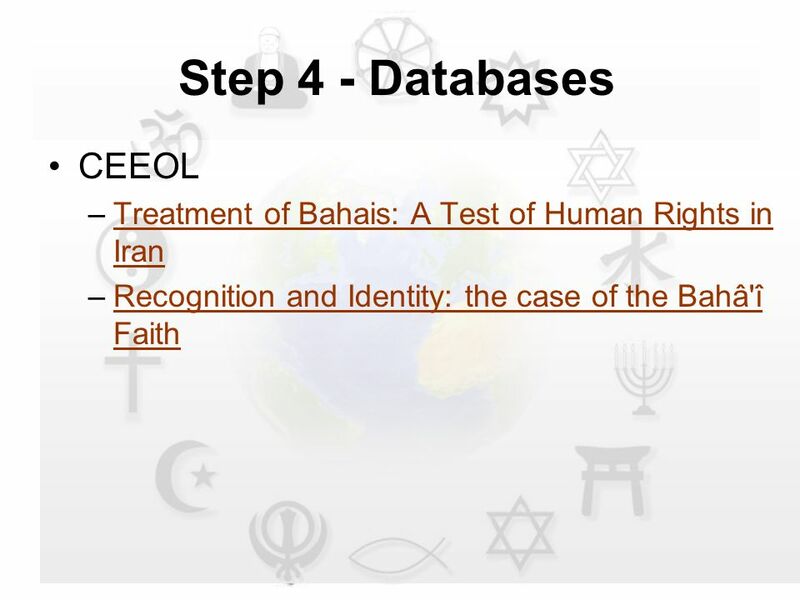 Session Outline: 1. 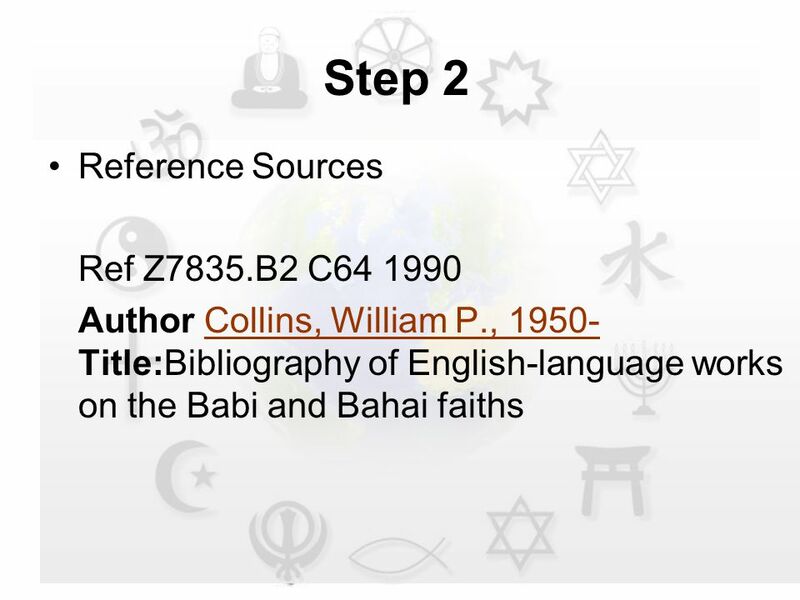 Research Strategy - the 8 steps including: Finding information on the subject guide Searching the library catalogue Searching online. 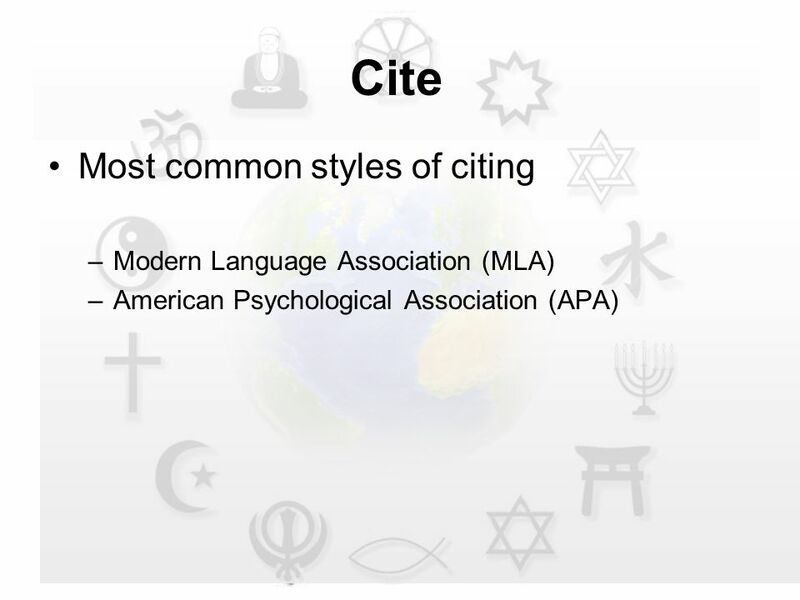 Research Paper Planning Guide Language Arts 11: Ms. Bower Dr. Peterson Librarian/Media Specialist NHS IMC The Research Project Calculator is based on the. 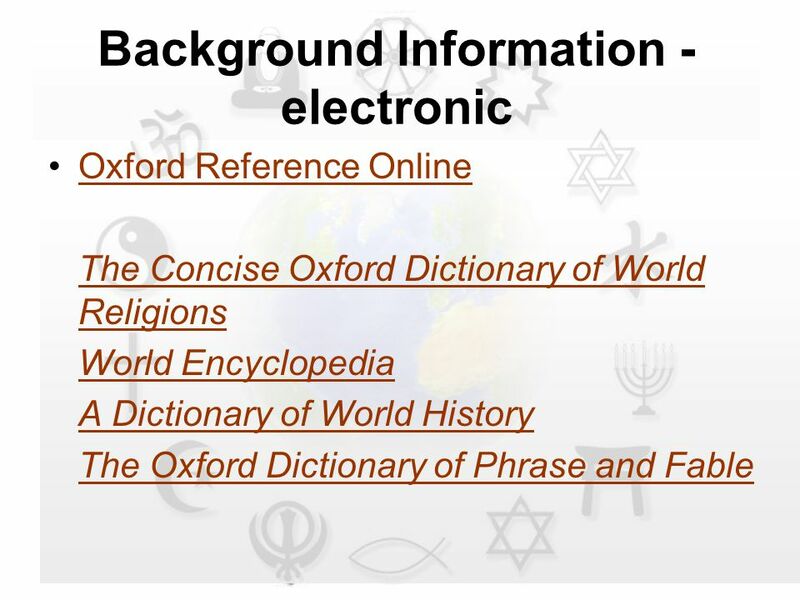 Knowledge Ontario An integrated and interactive digital environment about, and for, Ontarians. 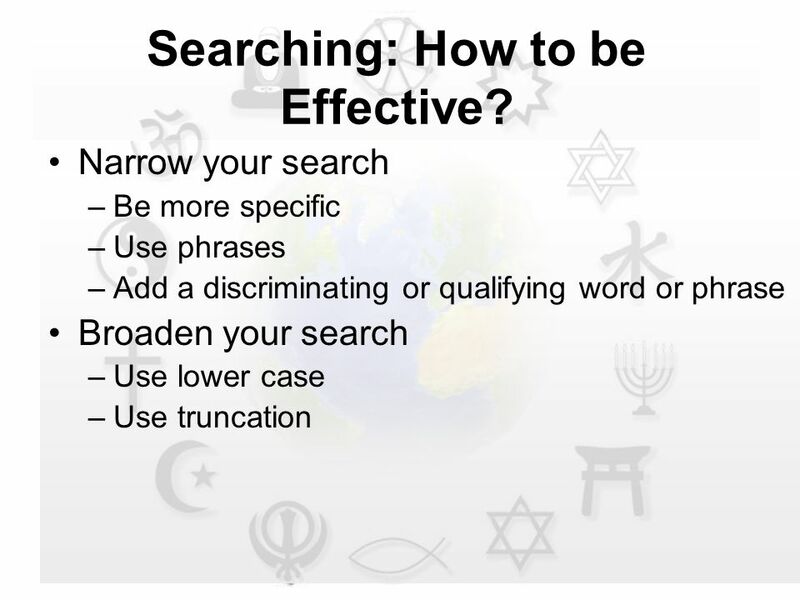 ENG 102 Persuasion Steps of Library Research Gergana Georgieva Information Literacy Librarian March, 2010. 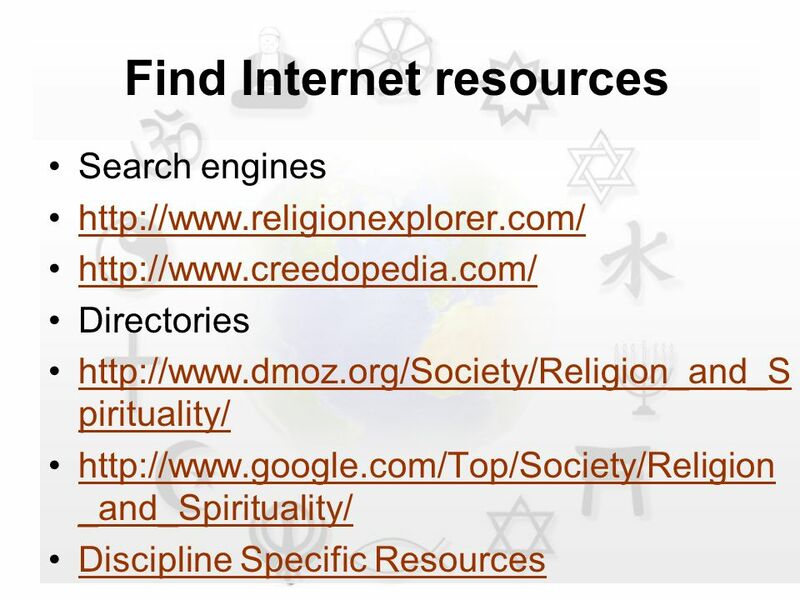 New Age Spirituality AUBG Library Resources Gergana Georgieva Information Literacy Librarian February, 2010. 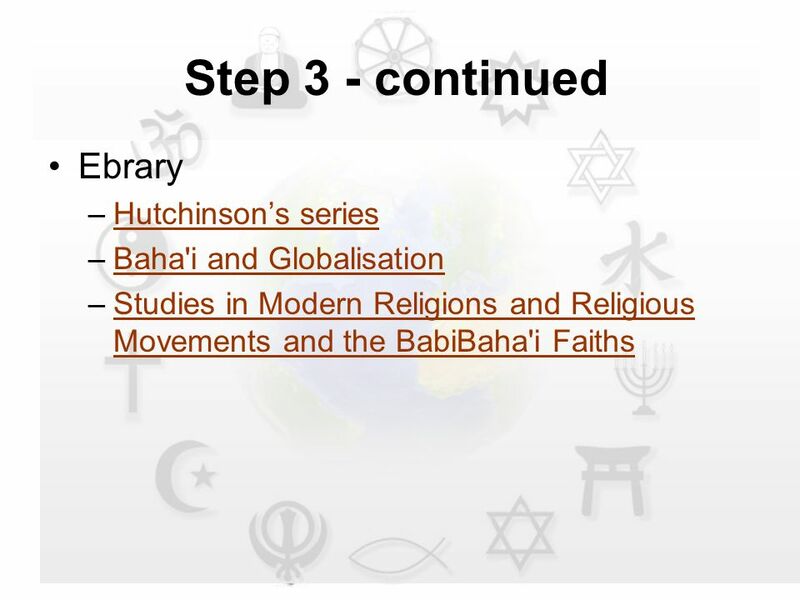 Falsifications in History AUBG Library Resources Gergana Georgieva Information Literacy Librarian 2010. 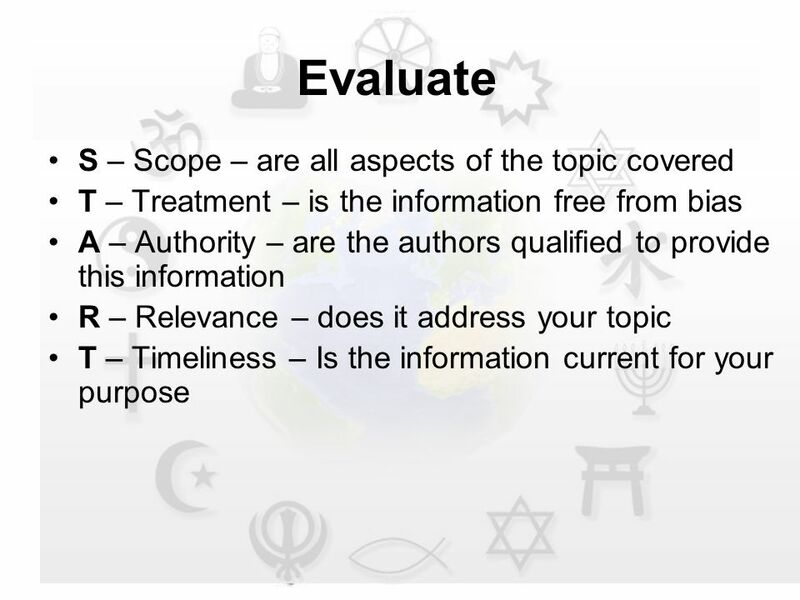 Assignments for the First and Second Year That Build Research and Information Literacy Skills PETAL Winter Workshop January 9, 2007 Marianne Simmons Lavery. 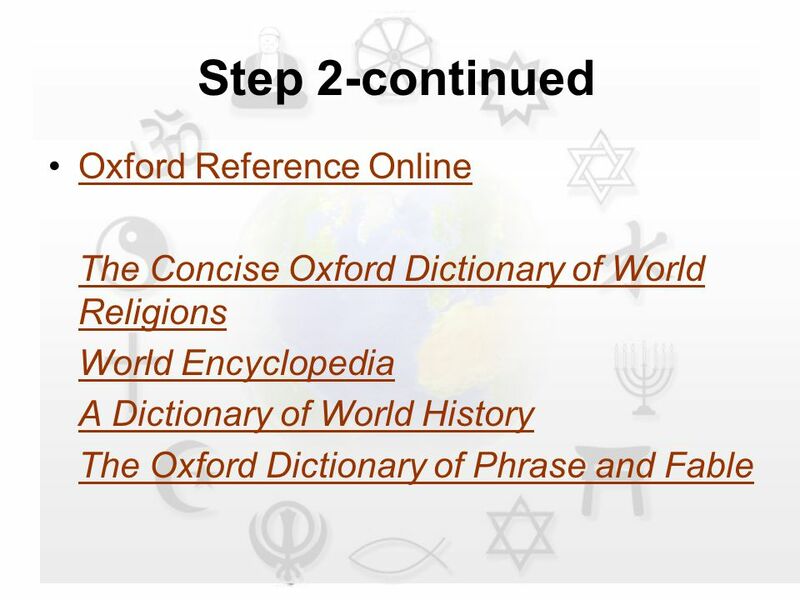 World Humanities LIBRARY INSTRUCTION Prof. Jacqueline A. Gill Ext Click the down or up arrows on. 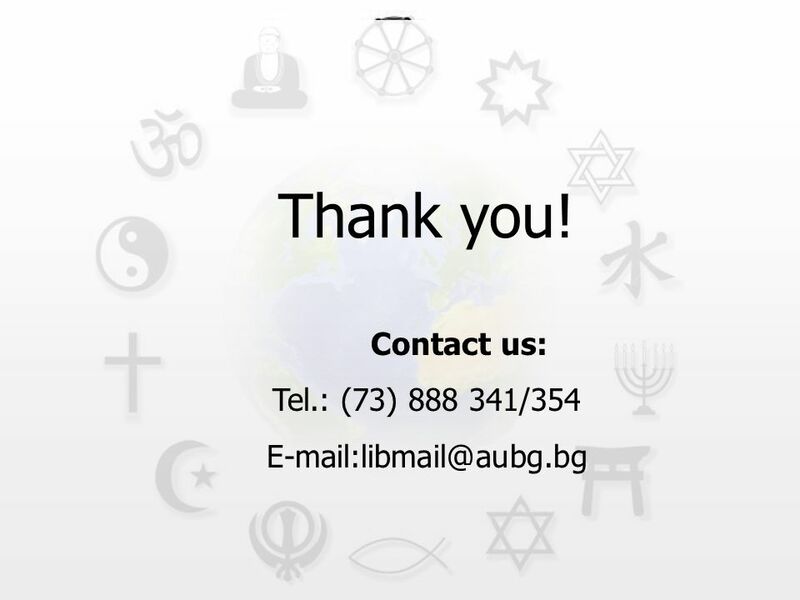 AUBG Library Freshman Guide Spring 2010 Gergana Georgieva Information Literacy Librarian. 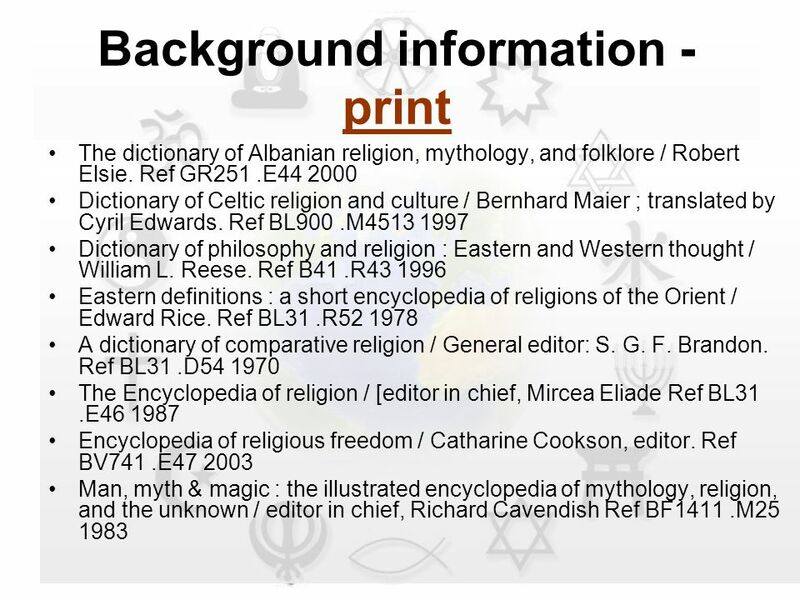 Byzantine History AUBG Library Resources Gergana Georgieva Information Literacy Librarian 2010. 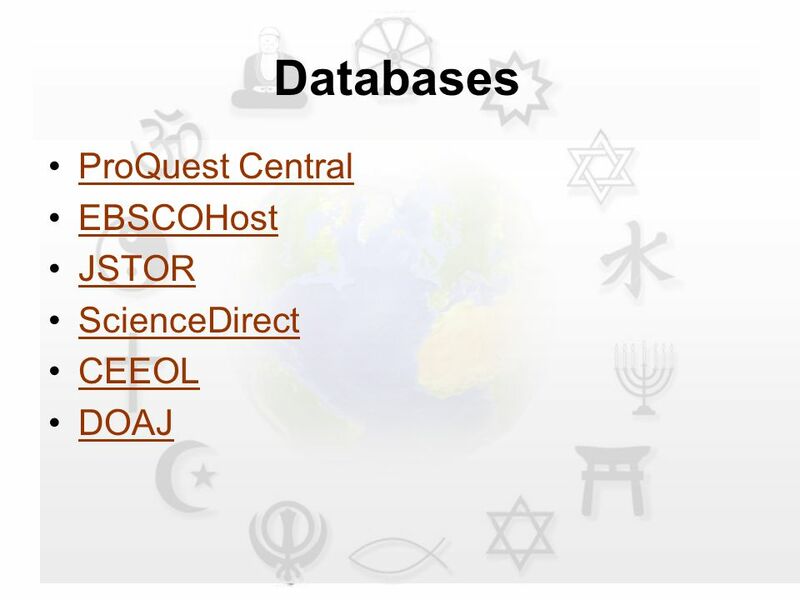 Fawcett Library Online Resources The Webb Schools of California. 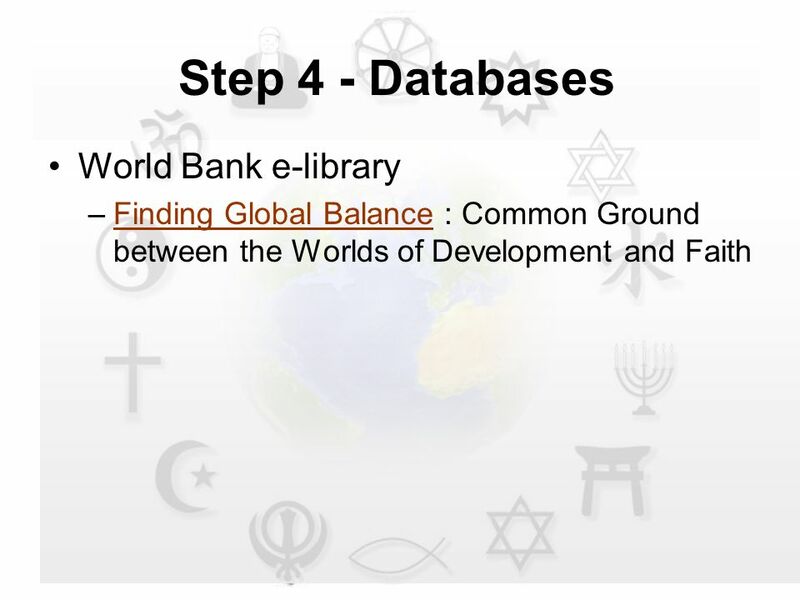 Introduction to International Relations AUBG Library Resources Gergana Georgieva Information Literacy Librarian March, 2009. 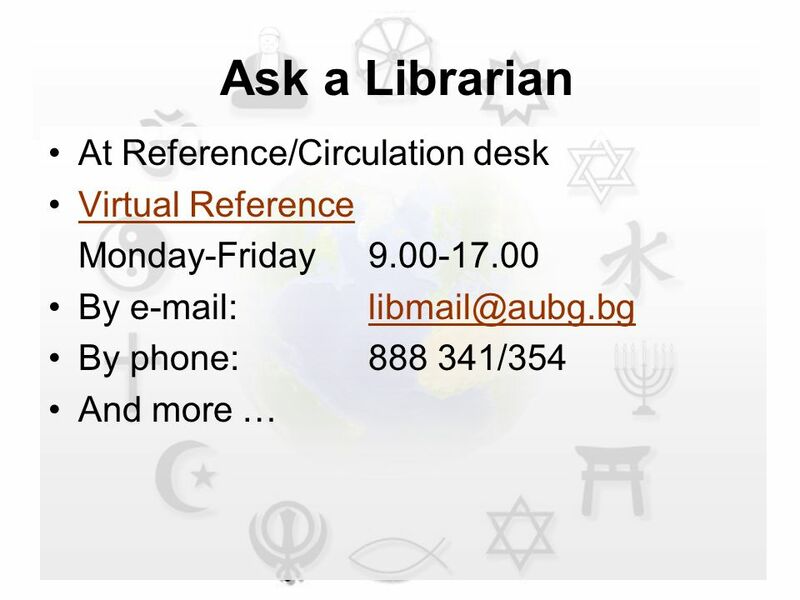 AUBG Library AUBG Country Representatives Library Training September 12, 2008 Gergana Georgieva Information Literacy Librarian. 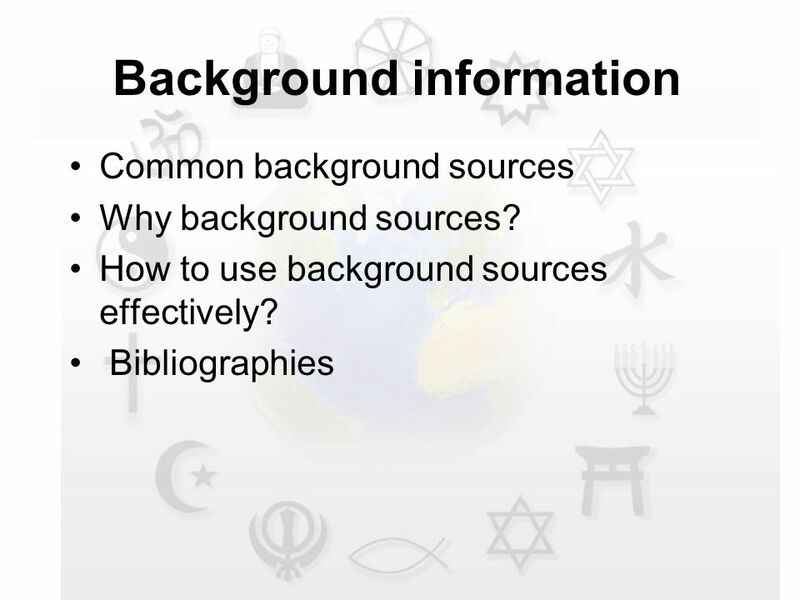 NSCC Library Services - How To Do Research 1 Nova Scotia Community College Library Services The Research Process Facilitator: Librarian’s Name Librarian’s. 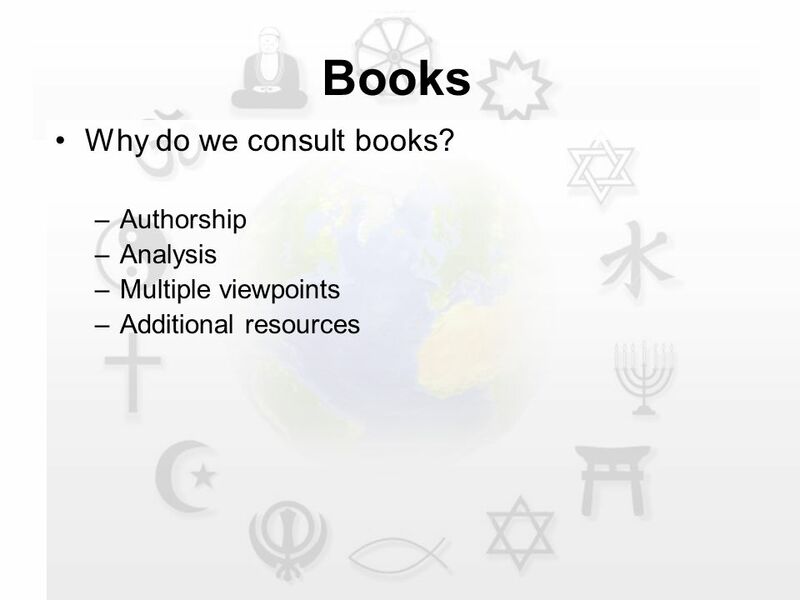 Topics in Comparative Politics: Middle East Politics AUBG Library Resources Gergana Georgieva Information Literacy Librarian March, 2009. 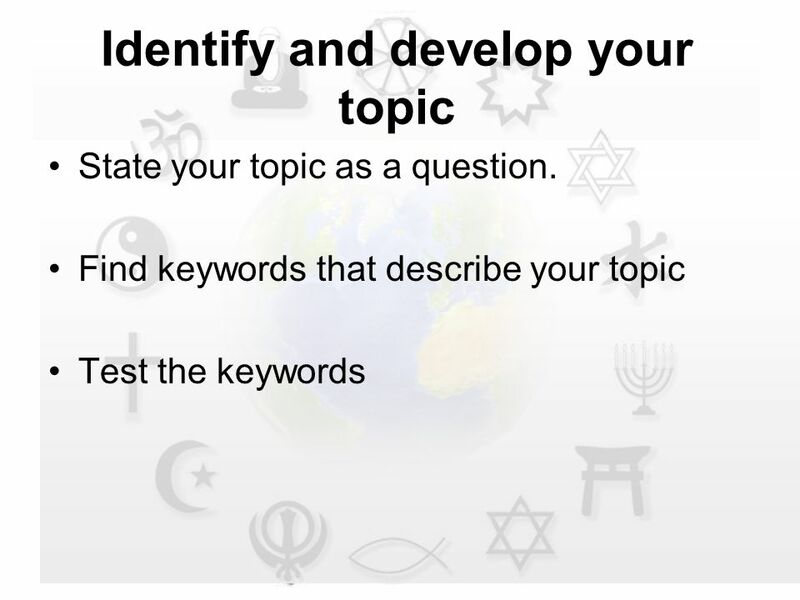 1 DEVELOPING A TOPIC ENGLISH 115 Hudson Valley Community College Marvin Library Learning Commons. 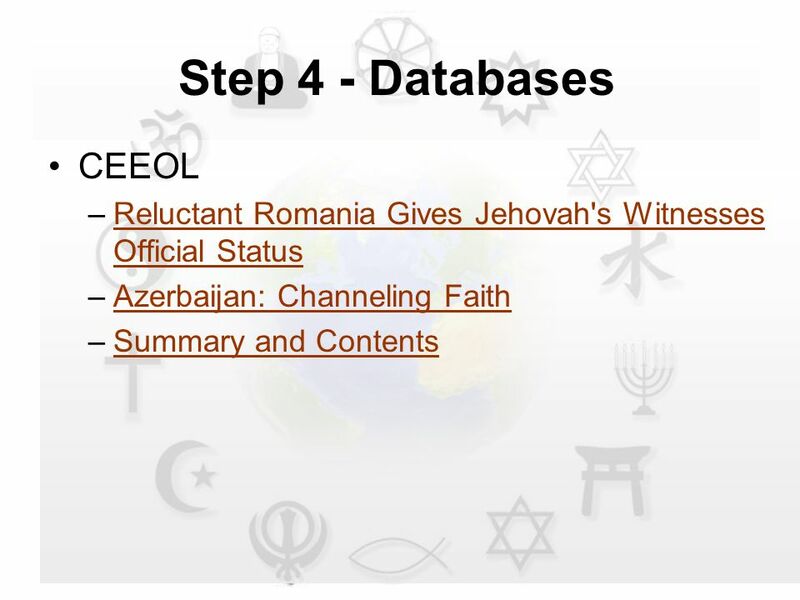 Information Literacy for Journalists Gergana Georgieva Information Literacy Librarian January 26, 2009.